Step back in time and explore the key historic buildings that were built during the thriving lumber era in Cadillac. Many of these buildings still stand proudly today. 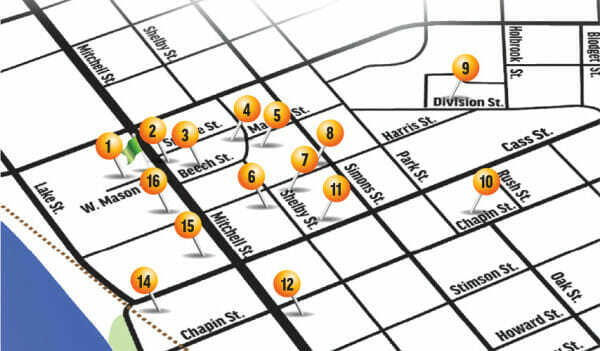 See the map below that corresponds to the numbered items underneath. 1. Former Cadillac City Hall: 201 N. Mitchell St. – Built in 1901, this Richardsonian Romanesque-inspired building served as Cadillac’s City Hall and Central Fire Station until 1977. Currently it is being used for commercial and office space. National Register listed 1986. 2. Cummer-Diggins Lumber Company Office: 130 N. Mitchell St. – This structure was built in 1909 to replace the smaller office building occupied by the Cummer Lumber Company. The Cadillac News acquired it in 1936 and still occupies it today. 3. Masonic Temple: 122–126 Mitchell St. – This Victorian Romanesque-style building was built in 1889 by the Masons who also leased space to Wexford County to use as court offices until the new courthouse was built in 1913. It currently serves as retail space on the ground level and the Masonic Lodge Hall on the upper levels. 4. Former Carnegie Library: 127 Beech St. (corner of Beech & Shelby Sts.) – Built in 1906 with funds from the Carnegie Foundation and City of Cadillac, this Classical Revival Style building served as the first public library in Cadillac until 1969. It then housed the Cadillac Police Department for eight years before becoming the Wexford County Historical Society Museum in 1977. In 2009, the copper dome was completely restored. 5. Charles T. Mitchell House: 118 N. Shelby St. (corner of E. Mason & Shelby Sts.) – This prairie-style building began as a Second Empire house, built in 1874 by George Mitchell.From 1878 to 1922 it was owned by his business partner Wellington Cummer, then purchased and renovated by Mitchell’s grand-nephew, Charles T. Mitchell, in 1926. 6. Touring the Post Office: 118 E. Harris St. (corner of Harris and Simons Sts.) – Built in 1915, the classical-styled post office replaced the smaller structure on S. Mitchell Street. A lawn area in front was later sacrificed to create angled parking spaces. 7. Touring First Congregational Church: 200 E. Harris St. (corner of Simons & Harris Sts.) – This Colonial-styled brick church was built in 1924 after the original structure (on the corner of Shelby & Harris) burned down. 8. Touring First Presbyterian Church: 221 E. Harris St. (corner of Simons & Harris Sts.) – The original wood-framed church on this site was built in 1873 and burned in 1904. This current brick structure was built in 1906 and still contains the original 1873 bell in the steeple. 9. Wexford County Courthouse: 437 E. Division St. – At a cost of $85,000, the courthouse and jail complex was built and dedicated in 1913 by Governor Woodbridge Ferris. The courthouse is still in use today. 10. Frank J. Cobbs House: 407 E. Chapin St. (corner of Park & Chapin Sts.) – This former home of Frank J. Cobbs, a prominent lumberman of Cadillac, was built in 1898. 11. William W. Mitchell Home: 205 E. Cass St. (corner of Cass & Shelby Sts.) – Built in 1890, this elegant home belonged to lumberman William W. Mitchell, nephew of Cadillac founder George Mitchell. Many of the original interior furnishings and fixtures still remain in the home today. 12. Cobbs & Mitchell, Inc. Building: 100 E. Chapin St. (corner of Chapin & Mitchell Sts.) – Constructed in 1907, this Neo-Classical building served as the showcase offices of Cobbs & Mitchell Lumber Company. At the time, it was the largest office building constructed in northern Michigan and one of the most opulent, featuring nine varieties of native Michigan woods in the building’s interior. 13. Cobbs & Mitchell Mill No. 1 (informational site): 329 South St. at Lake Cadillac. (Harbor View Apartments & Park) – In June 1871, this site served as Cadillac’s first sawmill location. Originally called the Pioneer Mill. 14. Touring Ann Arbor Railroad Station (corner of Cass & Lake Sts.) – This classic brick railroad depot was built in 1911 to accommodate Cadillac’s needs for add’l passenger services. 15. City Park and the Shay Locomotive – This land was given to the City of Cadillac by George A. Mitchell in 1874. Because it was low and swampy, Mitchell brought in fill dirt to make it more usable for Cadillac residents. On display at the south end of the park is the SHAY logging locomotive. Invented by Cadillac resident Ephraim Shay in 1879, this steam-powered locomotive was one of the first designed to haul logs year-round from the rivers and sawmills to nearby railroads for transportation. 16. 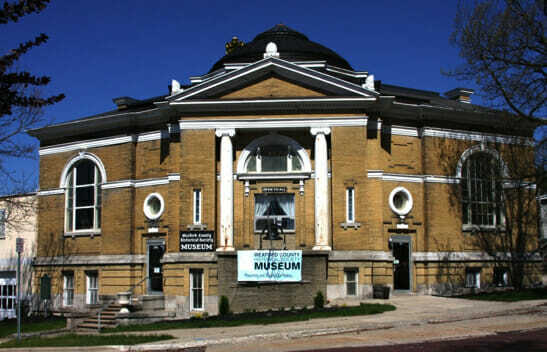 Touring the Elks Temple Building: 122 S. Mitchell St. – Located in the heart of Cadillac, this Neo-Classical Revival building is flanked on either side by commercial buildings and is a well-preserved example of fraternal/lodge buildings in Cadillac. Built in 1911 at a cost of $53,000, this 3-story building houses the Elks Temple and two retail stores.